It all started during the summer of 2010, in Columbus, Ohio. The Women of Capital Park apartment community had enough of the violence. But instead of mobilizing out of fear, they came together, empowered. 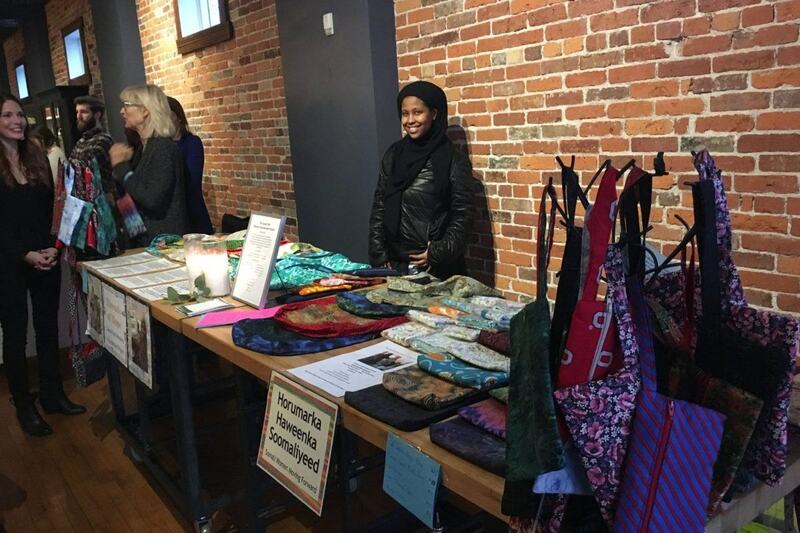 Following an intense summer of violence at the apartment community, a group of Somali women formed the Capital Park Women’s Empowerment Project. Capital Park is home to 380 households, 360 of them are Somali. The women then partnered with Cambodian Mutual Assistance Association. CMAA was founded in 1980 by a group of Cambodian refugees to meet the needs of Southeast Asians, and all other refugees being settled in Franklin County, Ohio. CMAA provides recent immigrants with English as a Second Language (ESL) courses, employment counseling, and interpretation/translation, among other services. CMAA also helps integrate new immigrants into American culture and workplace etiquette. Two women participants in CMAA listen during a class on sewing. Ohio is home to the second largest Somali immigrant population in the United States. Following the collapse of the Somali government, and subsequent civil war, the United States began to admit Somali immigrants into the country in greater numbers. 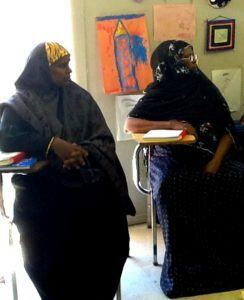 CMAA has a long history of partnering with Somali community organizations. The first initiative for the women of Capital Park was to improve safety, and stem the violence taking root in their community. CMAA was there to help. According to Beth Stock, Director of CMAA, “There was a huge series of issues.” Stock went on to explain that people were being assaulted on and around the Capital Park apartment community. An old man seriously beaten. A woman accosted. Domestic violence and burglaries became a trend, with no resolution in sight. Before relocating to the U.S., Somali families sought refuge in neighboring countries. “They have horror stories of being in refugee camps in Kenya, then to come here, where they’re supposed to be safe, and be afflicted with more violence is just terrible,” Stock says. The trauma of war, refugee camps, relocations, and poverty transformed Capital Park into a dispirited community, troubled by their own misguided youth. “[The apartment community’s] management didn’t believe there was a problem because there was no documentation, no one called the police and no one talked to management,” Stock explained. The women who founded the Capital Park Women’s Empowerment Project came together and reflected on the situation and their community. At first, they didn’t think they had the skills to deal with Capital Park’s management, or the police. As a result, CMAA was able to get grants to clear brush between the neighboring community garden and Capital Park buildings, a place where youth would loiter and engage in criminal activity. They were also able to secure better security lighting, and a part-time security officer. With the success in executing their first initiative, the Capital Park Women’s Empowerment Project continues working to improve the lives of women in the Capital Park community. “Most of the women are going to school for the first time,” Stock says, “Those who have jobs have been cleaning day cares and offices.” There is a gap in economic autonomy for these women, as it is very difficult for them to find meaningful work. Recently, CMAA has been blessed with several sewing machines, and a new initiative was created. Two participants proudly show off their work. “They’re learning how to repair clothes,” Stock explains, “Three grandmothers in the group grew up in the bush. 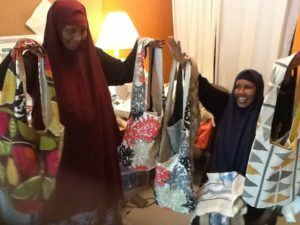 They learned the art of weaving rice sacks.” The women plan to use these skills to create a cooperative business, making distinctly Somali shoulder bags. They have created patterns for bags that can be sold not only in their own community, but others as well, including college students. “[The women have] a major entrepreneurial spirit,” Stock says. With a fresh impetus to work towards a greater sense of economic autonomy for those involved in the Capital Park Women’s Empowerment Project, Stock applied for a grant from Mary’s Pence. In line with Mary’s Pence values and mission, the funds will be used to purchase more sewing machines, fabric, and supplies; some of the funds will be used to pay a sewing teacher’s stipend, and some will be used to pay an instructor to teach business skills.